Noodles or onions? Why not get both with out French Onion Noodle Soup recipe. 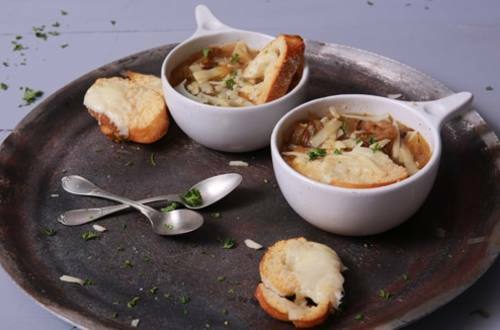 We’ve taken the classic French onion soup and added our own noddle-filled twist. 1 Melt Spread in 5-quart saucepot over medium heat and cook onions covered, stirring frequently, until onions are caramelized, about 15 minutes. Stir in wine and cook 1 minute. Stir in broth and Knorr® Pasta Sides™ - Butter & Herb; heat through. 2 Meanwhile, line broiler pan with aluminum foil. Arrange bread on pan, then top with cheese. Broil 1 minute or until melted. 3 Serve cheese bread with soup.